Buy a shining centerpiece for your home! The FairForward Diamond Vase XS is more than a diamond in the rough. 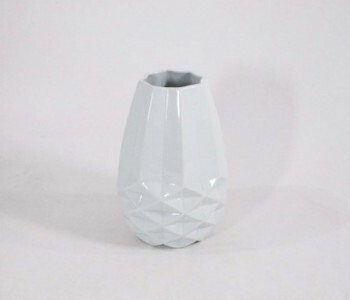 This small vase of white ceramic has a facet-shaped bottom and sleek lines. The size of this fair trade vase makes it especially suitable for smaller or single flower arrangements. Why not combine it with the larger Fair Trade Original vases for a stylish combination? The FairForward Diamond Vase XS is a small, white vase with sleek lines. The facet shapes on the bottom of the vase are particularly striking. This designer element is most associated with the shape of a diamond. Though you could just as easily make the connection with origami, the series with which FairForward put this product on the market. In Thailand – where the Diamond is produced for Fair Trade Original, origami is indeed popular. This fair trade vase is a great addition to your home, especially in combination with its larger brother. FairForward designs fair trade gifts and home accessories under the Fair Trade Original brand. The Diamond Vase XS by FairForward is manufactured in a fair way and the Thai producers can actually make a living from their work. We invest in a sustainable future! The FairForward Diamond Vases are striking and elegant at the same time. The sleek lines and facet-shaped bottom are suitable for any living room. The Diamond Vase XS is a small ceramic vase and is 18 cm high and has a diameter of 13 cm. This designer vase by Fair Trade Original is especially suitable for flower arrangements. A larger version of the Diamond and Origami vases, 30 cm high and with a 20 cm diameter, is also available. This ceramic fair trade vase is the ultimate home accessory. On the shelf at Holland.com it’s just a diamond in the rough. Will your home transform it into a shining centerpiece?